The sound of Israeli jets and the rumble of explosions were heard again in Gaza on Monday. Sitting in the centre of Gaza City this mini-conflict has an almost surreal quality. With the windows open, a distant rumble very like thunder rolled across the city each time an Israeli strike hit home. But down below on the streets the cars kept passing, the shops stayed open, pedestrians kept walking home with their groceries. After years of blockade and repeated rounds of air strikes Gazans appear almost inured to the endless conflict. Further out of the city, closer to the Israeli border, the atmosphere is different. The streets are quieter. On the northern outskirts of Gaza, I was taken on Monday to see one of the latest bomb sites. A four-storey house had been completely destroyed. Its roof had collapsed inwards; tables and chairs, bedclothes and children's toys spilled out of its squashed floors like shopping from a torn plastic bag. The ground around the house was charred black and smelled of burning. Groups of children standing in the rubble pointed up in to the sky directing my eyes to the Israeli drones circling high over head. At one point I counted four circling together over a point further south, their powerful cameras hunting the ground below for any sign of militants trying to launch rockets in to Israel. Then suddenly as we were filming a rocket streaked in to the sky a kilometre or so to the west - a long white trail tracing its path in to the clouds. Within a minute the rumble of thunder could be heard again, Israel's response had been swift. Back at the bomb site, I met the man who owned the pile of rubble that was - until last night - his home. Amazingly no-one was killed in the explosion, despite the complete devastation. On first inspection it looked like one of Israel's missiles must have gone astray, a case of collateral damage. But on closer questioning the pictures changes. "I have already lost one son to the struggle for liberation," the man told me. "I have two more, and I am willing to sacrifice them too." One of his sons is in the al-Qasam brigades, he says, the other in Islamic Jihad. "After the attack last night (Sunday) the Israeli Shin Bet (Internal Security) called me on the phone to tell me it was because of my son's activities," he says. I asked another local how it was that so many people could have escaped relatively unscathed from a building that was so completely destroyed. "Sometimes the Israelis call up the person beforehand and warn them that they have 10 minutes to leave the house, then they strike." This is a strange conflict, between old enemies who know each other extremely well. Israel had forces and settlers in Gaza from 1967 until 2005, but has since maintained control over most of the strip's borders, its airspace and coastline, and has blockaded the territory. Its military and intelligence services know every inch of this narrow strip of land, even the home telephone numbers of their enemies. But familiarity has not softened the anger here at the great historical injustice they believe has been inflicted on them by Israel. "What do you mean when you say you are struggling against the occupation?" I asked one Gazan. "After all Israel pulled out of Gaza in 2005?" "We mean the occupation of Jerusalem, and Jaffa and Haifa and all the other places that belong to us," he said without hesitation. 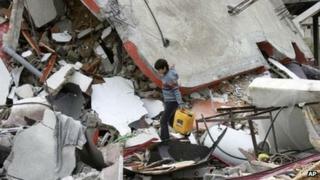 A short distance away a group of young boys sat on a pile of rubble, chatting and smiling at the foreigner. "Hello, how are you?" they shouted and then squealed with embarrassed delight. Their parents knew what it was like to take the bus to Tel Aviv or Jerusalem for the day. But now these children are growing up behind a high wall. They have never been to Israel and never met a Jew. The only thing they know about Israel is its drones and its missiles. Seeing those children makes me feel very pessimistic that this conflict could ever find an end. Correction 29 March 2012: This report has been amended to remove a reference that the Israeli occupation of Gaza ended in 2005.